In this photo released by the Italian firefighters, rescue teams work among the rubble of the collapsed Morandi highway bridge in Genoa, northern Italy, Tuesday, Aug. 14, 2018. The bridge collapsed during a sudden, violent storm Tuesday, sending vehicles plunging 90 meters (nearly 300 feet) into a heap of rubble below. 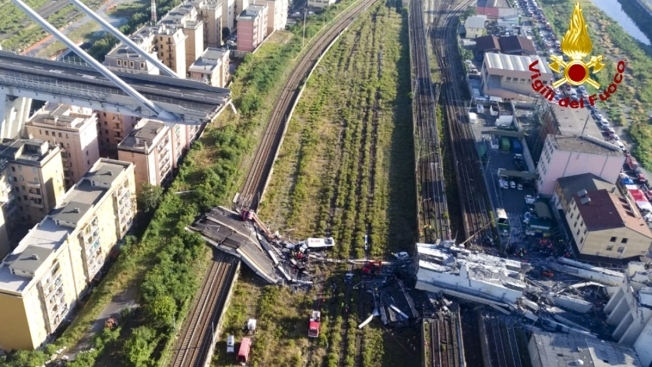 Italy's president demanded guarantees Saturday that all the nation's roads are safe following the Genoa highway bridge collapse, after he hugged and comforted mourners at a state funeral in the grieving port city.